When you think of the U.S.A., there are probably a lot of delicious sandwiches that come to mind. However, it's the grilled cheese sandwich that is one of those tasty, comforting creations that downright symbolizes Americana. Traditionally, this sandwich is made by layering sliced cheese between two slices of white bread, smearing the outside with butter, and grilling the entire sandwich until the bread is crisp and golden brown, and the cheese is melted and gooey. But that's not it for this amazing sandwich. From the vibrant and wacky rainbow grilled cheese sandwiches to the plain and simple tomato and cheddar combination, there are a plethora of variations when it comes to the grilled cheese. Smørrebrød simply translates to "buttered bread", but that's not all there is to this tasty and texturally-pleasing Scandinavian sandwich. The base is typically made using a super dense, thickly sliced, rye bread, which is slathered with butter, sour cream or some sort of horseradish schmear, and is then topped with a variety of fillings and served open faced. The traditional toppings typically include pickled or smoked fish, liver pate, sliced cold cuts, and boiled eggs. The Smørrebrød pictured is loaded with potato salad, fresh herbs, sharp red onions and crispy fried shallots on a dense and seeded rye toast. The textures and flavor combinations make this sandwich truly remarkable and a must-try for sandwich enthusiasts across the world. Egypt's national sandwich is definitely one of the most flavorful and colorfull dishes on the list. To start, chickpeas are ground up with finely chopped onions, fresh herbs and middle Eastern spices. They are then shaped into 1.5 inch balls and deep fried to golden perfection. The fried falafel balls are then stuffed into a warm pita and served with a variety of fillings, which range from the traditional shepherd's salad (cucumber, tomato and green peppers) to unusual brightly colored pickles like hot pink turnips, green cucumbers and deep red beets. Additionally, you're likely to see the falafel sandwich is also smeared with a delicious spread like hummus, baba ganoush, white sauce (either yogurt or tahini based), and spicy harissa pepper sauce. Although there are many sandwiches associated with Italian food, like their infamous porchetta sandwiches, grilled paninos, and fresh baguettes, tramezzini are the iconic Italian finger sandwiches that are perfect for snacking. Similar to English tea sandwiches, these flavorful triangular sandwiches are made with crustless soft white bread and homemade mayonnaise. They're typically served and sold between breakfast and lunch at many restaurants and bars in Venice, Italy. To make these petite Venetian snacks, it's crucial to start with some really good homemade mayonnaise and soft, crustless white bread. After that, the options for fillings become endless! It's no surprise that France comes into this sandwich collection with the most rich and decadent sandwich of them all - the Croque Monsieur! So what goes into this beast? Sliced ham, dijon mustard and gruyere cheese (or sometimes Swiss) are added between two slices of thick, buttered bread. The whole thing is fried, like a grilled cheese, and then finished with a rich and creamy béchamel sauce that is poured over top. The whole thing goes under the broiler, until the top gets crispy and becomes totally irresistible. You can even add an egg on top, which will change the name to Croque Madame. 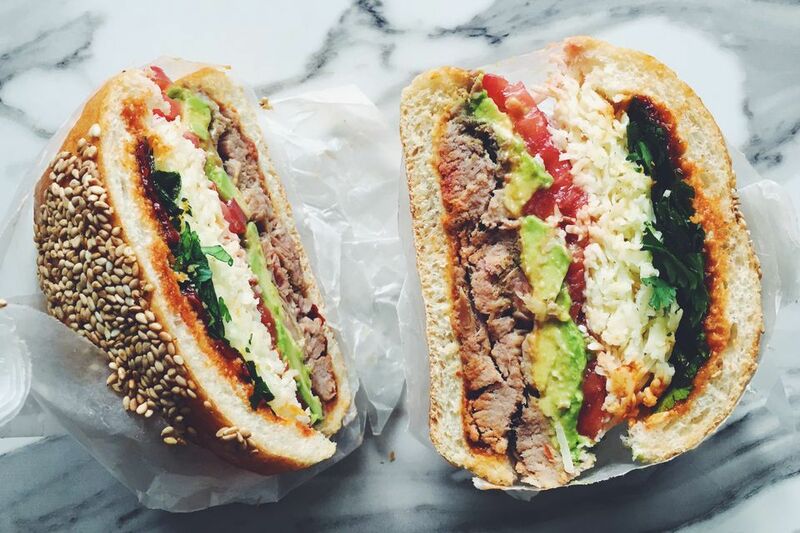 If you're a sandwich enthusiast, you've probably come across Mexico's infamous sandwich, the Cemita -or is it the torta? And you probably got pretty confused. Although there is not much of a difference, other than city of origin, both of these sandwiches are Mexico's contribution to the list. This hearty sandwich comes from the Puebla region of Mexico. Typically stuffed with a variety fried meats, avocado, queso, chipotles and red sauce, this sandwich is super versatile, while also being extremely delicious no matter the combination. Picking the national sandwich for England was pretty hard. There are a ton of unique sandwich combinations that put the Brit's sarnies on the map. To start, there's the delicious, yet slightly over-the-top, chip butty made with french fries, ketchup or brown sauce, and white bread. There's also the deconstructed sandwich, known as the Ploughman's Lunch, which features butters, jams, branston pickles, cheese and tomato. Oh, and there's the Christmas Leftover sandwiches, which are making their rounds on the internet, too. But before we get carried away, let's focus on a traditional staple of the United Kingdom - the English Tea sandwich. Because there are so many possible varieties, we'll stick to the classic cucumber, cream cheese and white bread tea sandwich. Feeling adventurous? Add a few herbs and flake salt for even more flavor! While in Greece, you're likely to find plenty of street vendors shaving meat off of vertical rotisseries and stuffing them into fresh pitas filled with tzatziki, french fries and fresh vegetables. Although in America, we typically associate gyros with shaved lamb stuffed pitas, that's not so common in its country of origin. Over there, it's more common to see chicken and pork than any other sort of meat. But, regardless of the filling, I think we all can agree that the gyro is a perfect sandwich no matter where you get it. Choripan is an Argentinian sandwich made with -you guessed it- grilled chorizo (chori) and crusty bread (pan)! The Arepa is definitely one of the most popular foods in Colombia and is eaten on a daily basis. Although most of the dough is made by hand at the desired time of consumption, it is also available pre-prepared at grocery stores across the U.S. and in South America. As for fillings, the options are endless as this type of sandwich is eaten for breakfast, lunch and dinner. One of our favorite variations includes a sweet corn arepa stuffed with black beans, plantains, crumbled queso fresco cheese and avocado. Thanks to Chef David Chang of Momofuku, steamed buns are popping up on menus all across the United States these days. From barbecued pork belly with pickles to deep fried tofu with crushed peanuts, the possibilities are constantly exciting and experimental. Traditionally, steamed buns (aka gua bao) are a Taiwanese mouth-shaped handheld delicacy composed of a light and fluffy steamed bun filled with meats, pickles, fresh herbs, crushed peanuts, and hot sauce. Almost identical to the Cuban sandwich we find here in the states, the Medianoche still consists of the same great flavors of roasted pork, swiss cheese, tangy mustard, and zesty dill pickles but built on different bread. Instead of cuban bread, which is almost like a french baguette, the Medianoche is served on a pressed sweet yolky bread similar to challah. Recipe Note: Be sure to swap out cuban bread for the sweet Medianoche bread which can be found at most Latin American grocery stores. The Bánh Mì is definitely one of the most flavorful, exotic, and complex sandwiches on our list. This Vietnamese sandwich is traditionally made using a Vietnamese baguette, which is pretty similar to a french baguette, but incorporates rice flour along with the wheat flour and has a thinner crust and airier inside. Stuffed inside the baguette is usually some sort of grilled meat, such as pork belly or the like, pate, pickled carrots and daikon, jalapeños, cucumbers, french mayonnaise, Sriracha, fresh cilantro and fresh mint.